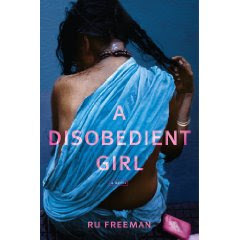 A Disobedient Girl: A Novel ; by Ru Freeman is an ambitious debut novel set to be released on July 21. The story takes place in Sri Lanka with a theme of class and servitude. The story is told in alternating chapters about two central female characters. Latha is a young servant girl to a wealthy family that includes Thara, a girl about the same age as Latha. Latha longs for the finer things in life and believes she was meant to have more in life than bathing at the well. She steals a bar of fine rose soap and sneaks off to bathe, using the soap belonging to the rich people she serves. She justifies this by telling herself how important hygiene is. The other central character is Biso, a mother with three children who eventually flees from her abusive situation. It is unclear through most of the novel how Biso and Latha's story will intersect, yet the reader can sense it surely will. Even though the stories are told in alternating chapters Latha's story takes place in the early 1980's into the early 1990's while Bios' story takes place over a period of just about four days. To say too much more would lead to spoilers so let me just give you my thoughts. I loved the writing and the setting was vividly portrayed as well. However, I found that the time frames seemed a bit confusing, and towards the end I was able to predict how the story might end. I also found both Latha and Biso unlikable, never really learning from their mistakes. In some ways this story reminded me of a favorite book of mine: The Space Between Us: A Novel , by Thrity Umrigar as that story too was also one about the "haves and the have nots". However, in that particular story the characters more sympathetic, and for me that makes all the difference between a great book and a so so book. I thought it was interesting to learn about how the author, Ru Freeman, got her inspiration for this book......she says, "My teacher, Lynn Freed, had given us an in-class assignment to write a paragraph, any paragraph, without thinking about anything specific. I wrote a paragraph about a woman standing in her doorway, her children somewhere off scene, watching her drunken husband make his way home through the mangrove swamps in a coastal town in Sri Lanka. At the end of the paragraph, she thinks about what she plans to do at dawn while he is still asleep. That paragraph turned into the first chapter of the book. It remains, largely untouched, as the first chapter of Biso's story". Despite some of my reservations about the book, I recommend you try this one for yourself and see what you think. this does sound like a good book. I do think it would be something I would enjoy. Great review. A great and honest review! I have never heard of The Space Between us before, but have just looked it up, and it looks really good - I've just added it to my wishlist! I enjoyed reading your thoughts about this book. I need to read an Umrigar novel!! I'm sorry to hear you didn't enjoy this book more! The Space Between Was a good story wasn't it? I'm sorry it didn't quite live up to your expectations. I think I'll go ahead and add this to my radar just because of the setting. I loved The Space Between Us; it really is one of those memorable books that give a great deal of insight into another culture and lifestyle. I was really interested in this one until you mentioned the unsympathetic characters. That is always an important aspect for me, I want to be able to like at least some of the characters! Great review ... and I love the story about how the paragraph led to the whole book and stayed pretty much intact! That kind of inspires me ... and it should inspire all wanna-be authors! And thanks for your kind comment the other day. I'm glad you found my blog and I'm glad you liked it. I'm sure I'll be back here soon too! I needed that refresher about your thoughts on this one. If I see it at the library I will be sure to check it out and see what I think. you did a great job on the review.. I will checkout the book. Thanks for a well thought out review! I love the story of how the author started the whole thing with that one descriptive paragraph. Thanks so much for the time and effort you put into reading and reviewing A Disobedient Girl!